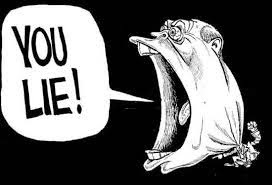 From my perspective, the political campaign season this time around is the most vitriolic, nasty and distasteful of any in my memory, regardless of which race you examine - and I've been watching this stuff for a long, long time. If you believed half of what lands in your mailbox these days, every single candidate should not be running for office - they should be drawn and quartered! 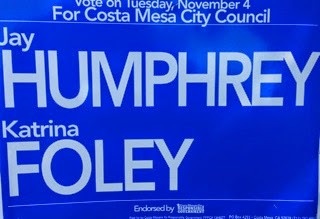 Distortions, fabrications and outright lies appear every day in the form of glossy fliers for almost every candidate. Most of them cannot be traced directly back to an opposing candidate - they are hidden behind the shield of political action committees and other out-of-town organizations - on both sides. A few concerned residents have done a good job of uncovering the funding sources for several of those groups and have posted that information on social media sites and elsewhere. This will look familiar to many of you - this image has been making the rounds in social media and was worn by a couple dozen members of the public at a recent City Council meeting. The issue of police staffing has been one of the many hot-button points of discussion during this campaign season. 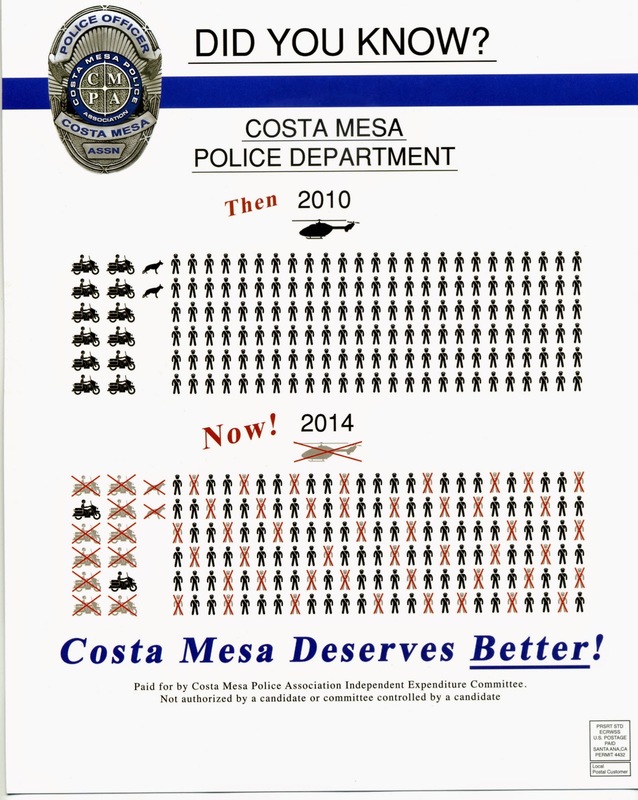 On this site we've discussed the reasons for the depletion of the staff of the Costa Mesa Police Department several times and who we hold directly responsible. This flyer doesn't cover all the details, but gives you the facts of the current situation. 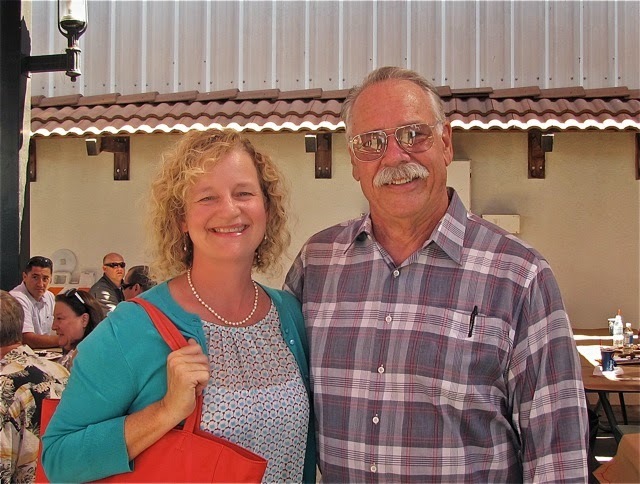 There is nothing in recent history that leads me to believe that the continuation of Jim Righeimer on the City Council will do anything but exacerbate the situation with the CMPD and the rest of the employee associations. He's demonstrated, over and over, that he has great animosity for the CMPD - from what I believe was a contrived confrontation at a DUI checkpoint while he was on the Planning Commission right on through to the bogus lawsuit he, his wife and Mayor Pro Tem Steve Mensinger have filed against those brave men and women. When the issue of police staffing shortages was brought up at a recent City Council meeting Righeimer's response during one of his many mini-tirades was, "We're gonna be just fine." Although the CMPA has been ready, willing and able to begin contract negotiations, they've been stalled because Righeimer and Mensinger are not eligible to participate because of that lawsuit and their compatriot - Gary Monahan - has been a no-show at scheduled meetings. 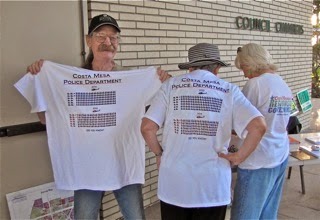 They have, however, given us every indication of how those negotiations will go with the result of the contract just completed with the Costa Mesa City Employees Association - the so-called "miscellaneous employees". That one was so draconian that take home pay for many of the members has been rolled back to numbers not seen for a decade! You may recall that one of Righeimer's first acts on the City Council was to initiate an attempt to layoff more than half of that group. That illegal act violated established city policy and the lawsuit it generated to protect the rights of the employees is still percolating. The flyer clearly outlines the staffing difficulties within the CMPD, but the reluctance to properly staff organizations so they can provide even minimal service levels is felt city-wide. There have not been the number of vacancies in city staff positions that we see today for decades! And that is only comparing them to the authorized staff. The authorized staffing level is down from optimal staffing levels of just a few years ago by more than 30%! Righeimer paved your streets by not providing adequate staffing for other critical areas, including public safety. 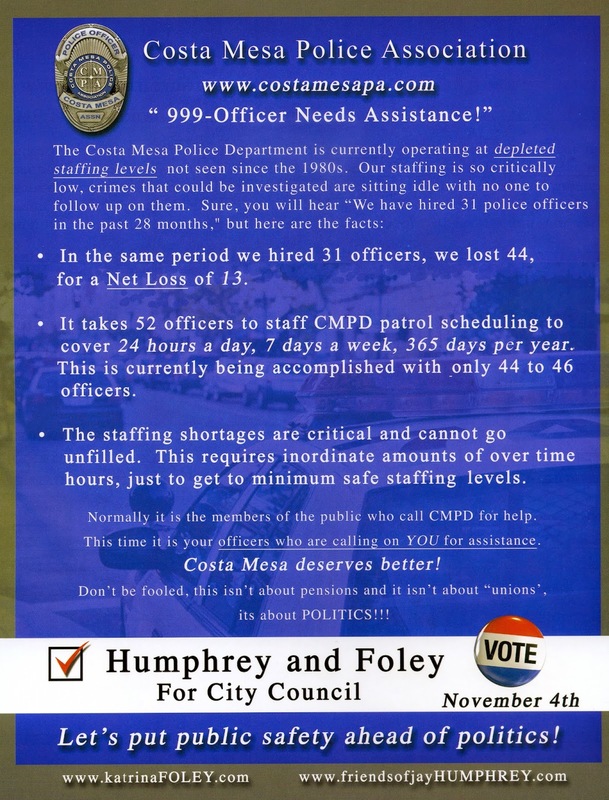 Thanks to the members of the Costa Mesa Police Association for producing this informative flyer, and for pointing out, once again, that the best solution for a safer city is a vote for Jay Humphrey and Katrina Foley on Tuesday. Completely, utterly and outrageously horrible thing to say. Jim Fisler is a despicable human being. What a complete lowlife!!! Jim Fisler "the police union supports liberals who support illegal aliens who kill cops., makes no sense." Oh how I long for a local government that shows leadership, and not dishonesty and BS. I want to know more about any relationship between Fisler, Hull, and city officials. Quick question - if Righeimer has a campaign warchest of nearly $200k, what has he been spending it on? I don't see any more of his signs than others, or any sign of him outspending other candidates tenfold. If there's money left, what happens to it? He becomes the banker for other Tea Party candidates in future races. eg: His failed 2000 campaign loaned $$$ to Dana R., which has never been repaid. How in the world could anyone vote for Jim Fisler? He's a lying, manipulative lowlife! I keep seeing the order of battle graphic and the subsequent casualty graphic indicating before and after levels in the CMPD. The before graphic shows 150 (6*25) officers, 10 motorcycle officers, two K9 officers, and a 'copter, which presumably had at least two pilots. That brings the before-the-cuts total to 164, which seems to indicate some double counting. Did we really have that many pool ce officers? The graphic makes no indication of command staff (chief on down).